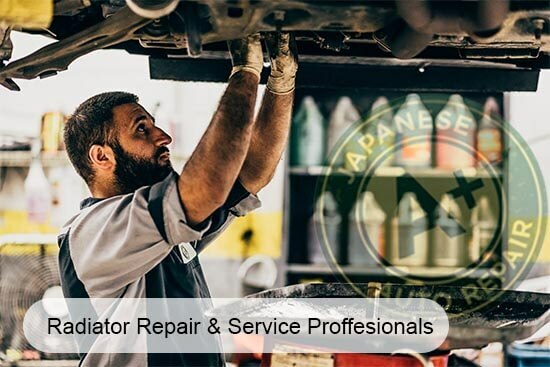 Radiator Repair & Service - A+ Japanese Auto Repair, Inc.
A+ Japanese Auto Repair specializes on radiator repair & service along with all other cooling system related repairs. Our industry trained and certified radiator repair staff is here to help. Please contact our staff or stop by today to speak with a radiator & cooling system repair professional. Our facility offers same day radiator repair & service. Industry trained radiator repair & service professionals. What are the signs of a bad radiator? Can I repair my radiator? How much does it cost to replace a radiator? Radiators can cost between $250 to $1000 depending on what type of vehicle you drive. On average, the replacement cost is $650. When replacing a radiator, be sure to factor in the cost for coolant, a new radiator cap, a thermostat, and thermostat gasket. All of these other cooling system components should be replaced at the same time as the radiator. It's also important to inspect the water pump for any signs of leaks. Do not drive your car with a broken radiator or a coolant leak of any kind. The loss of engine coolant will allow to engine to overheat. Once your engine overheats, you risk causing major engine damage and being stuck on the side of the road. Get to a safe place and shut off your engine off until you can have your cooling system inspected by a qualified auto repair technician. How long is a radiator suppose to last? Most radiators will last 7-10 years before losing cooling performance or failing. Today's vehicle radiators have plastic upper and lower tanks along with rubber gaskets which expand and contract over time which causing them to have a limited life. Most vehicles prior to 1980 had radiators made completely from metal and could last the lifetime of the vehicle with the proper coolant and care. How long will it take to replace the radiator? Radiator replacement with hoses, thermostat, gasket, coolant, and a new radiator cap will take 2-5 hours on average. There are vehicles that can take much more time depending on how many components are necessary to access to the radiator assembly. Can I make an appointment to change my radiator? If you need help, we would love the opportunity to repair or replace your radiator. You can call us immediately at 650-946-1856. We will arrange a tow truck, a courtesy car for you (if we have one available), and repair your coolant system. We are located at 780 Industrial Road, San Carlos CA 94070 and have been replacing radiators and repairing cooling systems for over 21 years. All radiator repair work will be covered with our 24 month / 24,000 mile warranty.